Until recently, consensus existed in certain circles that the African industry was not suitable for cost-effective production of quality, safe drugs. Yet, public and private pharmaceutical enterprises have cropped up on the continent, with some venturing into production of sophisticated and complex drugs, such as antiretrovirals (ARVs). In our study, we analyse and contrast the dynamics of local pharmaceutical manufacturing in Mozambique and Zimbabwe with the objective of understanding why pharmaceutical production in Africa is picking up momentum and the influence of global funding for ARVs in this process. 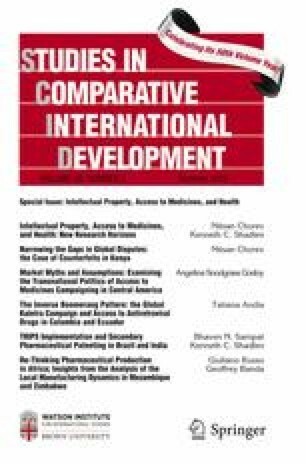 Our analysis identifies two routes of development for local pharmaceutical manufacturing: a favourable economic outlook and support from the international community created the necessary conditions for the development of the nascent pharmaceutical industry in Mozambique, while in Zimbabwe, the presence of an established local industry was instrumental in bringing in favourable, if not always coherent, government regulation. In both countries, the introduction of AIDS treatment created windows of opportunity for local production of pharmaceuticals by increasing public sector demand, providing fresh funds, and providing a justification for government regulation favouring local production. Despite the long-standing and well-known problems that created persistent shortcomings in human resources and in the economic and industrial environments, we conclude that pre-existing developmental roots, international funds and supportive state industrial policies are encouraging more manufacturers to enter the business of local pharmaceutical production in Africa. However, the opportunities brought in by fresh AIDS funds will need to be sensibly managed at both the local and global levels, as the world’s interest on the disease may not last in the long term. Glucose 1000 ml (5 %) inj. Chlorate of sodium 1000 ml (0.9 %) inj. Chlorate of sodium 500 ml (0.9 %) inj. Lamivudine + zidovudine (150 + 300) mg cps. Folic acid 5 mg cps. GIZ. Bringing Medicines to Low-Income Markets—A Guide to Creating Inclusive Business Models for Pharmaceutical Companies. German Federal Ministry for Economic Cooperation and Development (BMZ). 2012. http://www2.gtz.de/dokumente/bib-2012/giz2012-0025en-medicines-low-income-markets.pdf. Institute for Health Metrics and Evaluation, and Human Development Network the World Bank. The Global Burden of Disease: Generating Evidence, Guiding Policy Sub-Saharan Africa Regional Edition. The University of Washington and the Human Development Network. Washington, DC: World Bank. 2013. http://documents.worldbank.org/curated/en/2013/08/18187588/global-burden-disease-generating-evidence-guiding-policy-sub-saharan-africa-regional-edition. Kaplan W, Laing R. Local production of pharmaceuticals: industrial policy and access to medicines: an overview of key concepts, issues and opportunities for future research. 32036. HPN Discussion Paper. The World Bank. 2005. http://www.who.int/medicines/technical_briefing/tbs/KaplanLocalProductionFinal5b15d.pdf. Portal V. Lula Visita 1a Fábrica de Remédios Contra Aids Em Moçambique—Portal Vermelho. 2010. http://www.vermelho.org.br/noticia/141228-9. Sacco S. 2004. A comparative study of the implementation in ZIMBABWE and south africa of the international law rules that allow compulsory licensing and parallel importation for HIV/AIDS drugs. University Phd Dissertation. The American University of Cairo. http://repository.up.ac.za/xmlui/bitstream/handle/2263/1100/sacco_sf_1.pdf?sequence=1. Seiter A. A practical approach to pharmaceutical policy. Vol. 55203. Directions in development. Washington: The World Bank, 2010. https://openknowledge.worldbank.org/bitstream/handle/10986/2468/552030PUB0Phar10Box349442B01PUBLIC1.pdf?sequence=4. UNCTAD. UNCTADSTAT—Trade Statistical Database. United Nations Conference for Trade and Developtment. 2013. http://unctadstat.unctad.org/ReportFolders/reportFolders.aspx?sCS_referer=&sCS_ChosenLang=en. WHO. Local production for access to medical products: developing a framework to improve public health. WHO Public Health Innovation and Intellectual Property. ISBN: 978 92 4 150289 4. 2011. http://www.who.int/phi/publications/local_production_policy_framework/en/. World Bank. The World Bank Statistical Database. 2013. http://data.worldbank.org/.